Addition silicones are among the most popular elastomeric impressions at the moment. They are used mostly for fixed restorations such as crowns and bridges. They are very accurate and stable. Actually, this is the most dimensionally stable impression material. As mentioned the addition silicone impressions are often used in prosthodontics. They are ideal for removable restorations, also for the fixed ones. 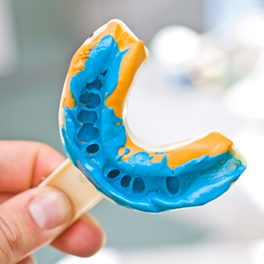 Another great advantage is that dentists can use them when they need several molds from one single impression. Bite registration impressions are another indication. The only problem with these impressions is when the dentist can’t have a good moisture control. There are many different types of addition silicones available on the market. The main group of silicon materials is divided in two: condensation and addition. The second ones are mostly used during restorative procedures. They were introduced after the condensation and are considered to have better properties than them. They enjoy this widespread use mostly because of the positive experiences that dentists have. Among the many types, the ones that are most commonly used are universal (medium-bodied) with a 35%-75% viscosity, heavy-bodied with a 60%-70% viscosity, light-bodied 5%-15% viscosity. All of these addition silicones have a certain polymerization time, according to the instruction manual. The thing is that they all use the same chemical reaction of polymerization. Every addition silicone material is made of two pastes. The first one is the base paste, that has to be mixed with the acceleration paste for the chemical reaction to begin. The base paste consists of polymethyl hydrogen siloxane, other siloxane prepolymers, and fillers. The acceleration paste includes divinylpolysiloxane, fillers, platinum salt, palladium and more. The general time of mixing is around 45s. The setting time is around 6 minutes. Some brands offer them in special cartridges and are mixed with an automix gun. The advantages of the use of these materials are numerous. That is the main reason why dentists tend to use them so often. First of all, these materials provide a very precise impression with a great attention to detail. Most of the fixed and mobile restorations require a very detailed impression so that the final product fits perfectly in the mouth. The second thing why dentists love them so much is the dimensional stability. After the impression is taken, some materials tend to shrink. That is why the mold might not be as precise as needed. With addition silicone materials there is no shrinkage. This leads to the fact that dental technicians can actually get more than one mold from a single impression. This might not be the case with a number of the other materials. Patients have a very high tolerance for this type of dental material. One of the biggest problems in the past for addition silicones was their hydrophobic character. Due to the way of production, dentists had to be careful and provide a dry area. Today, thanks to advanced technology, dentists are past that problem. These materials can be very costly.